Saint Thomas who was an apostle of Jesus Christ established seven and half churches in India and was called as Seven and Half Churches or Ezharappallikal. 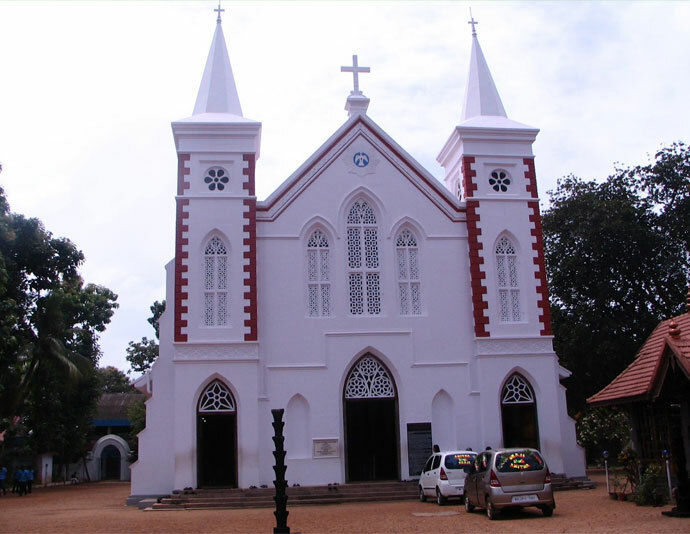 One of these churches is the St. Mary’s Orthodox Syrian Church at Niranam which is popularly called as Niranam Valiyapally. This church was built in AD 54. Even though it was initially built by St. Thomas, this church had undergone several renovations. The church that is seen present is the fourth building that has been reconstructed. This church has the ancient temple architecture which is very beautiful. Some of the main attractions here include a cross that is made out of granite, relics of St. Thomas, golden cross etc. The base of the granite cross has various carvings which resemble that of the Hindu temples. The church is proud to have two statues of St. Mary which are made of Marble and in pure Gold. There are 5 altars in Niranam church. At present a large number of Christians come here to worship. The Christian community in Niranam is considered to be the oldest of all in the world. Some of the main feasts held here include the Feast of St. Mary which is celebrated on 15th August. This feast is conducted in memory of the death of St. Mary whose body was taken to heaven by the angels. Feast of Nativity of St. Mary is also celebrated. Another feast celebrated is the Feast of St Thomas which is held in memory of St. Thomas and to think about the pain and trouble he has taken to preach the gospel in India. It is celebrated on 21st December. Some other feasts conducted are the Feast of St. Behanan and Feast of Mar Thoma II and Mar Thoma V.